While everyone (including the government) has focused their attention on the residential market, one segment that has gone through the roof is industrial property. In 3Q2012 the Industrial Property Price Index registered a stunning 8.8% quarter-on-quarter growth to hit 183.3, an all-time high. This was the twelfth quarter of growth, and unlike the residential property segment, the rate of growth is accelerating. This begets the question – have industrial property prices spiraled out of control? 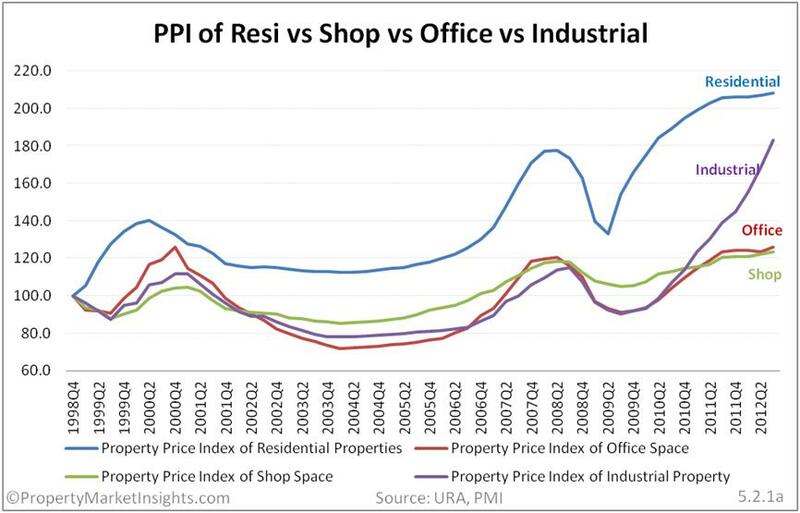 From Figure 5.2.1a (courtesy of PropertyMarketInsights.com, an essential resource for property investors), we can see that since 2010, the once boring industrial PPI has risen at a much faster pace than the other property types, and has massively outperformed Office and Shop properties. Since 2009Q3, the Industrial PPI has grown by an astonishing 102.8%, versus just 34.9% for the residential PPI. 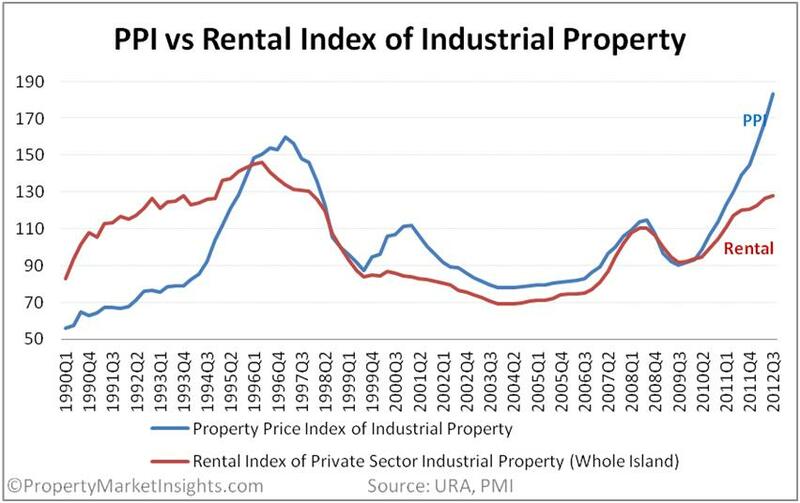 And as the Rental Index for Industrial Property has only increased 39.3% over the same period, this suggests that: i. Yields for industrial property are compressing and ii. There’s likely some element of speculation in the industrial property market, i.e. the rise in industrial property prices were not mainly driven by strong end-user demand. Is industrial property now too expensive for industrialists? 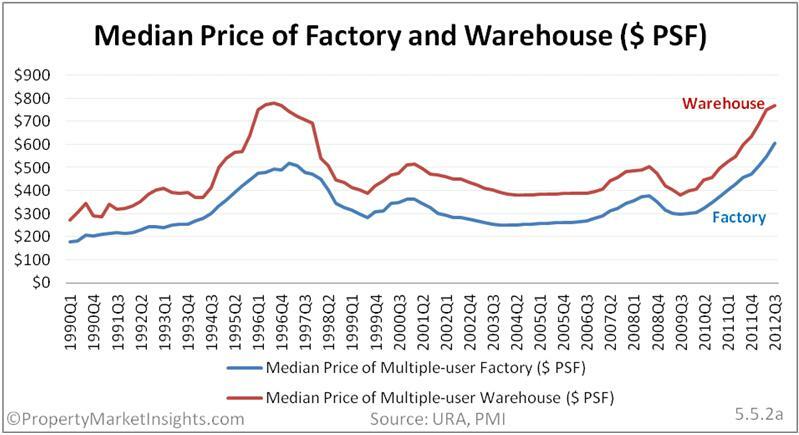 From a median price perspective, in 2012Q3 factory and warehouse space sold for $606 and $768 psf respectively (Figure 5.5.2a). This was more than double what it cost just five to six years ago. Rentals have gone up as well, although not as much as prices. 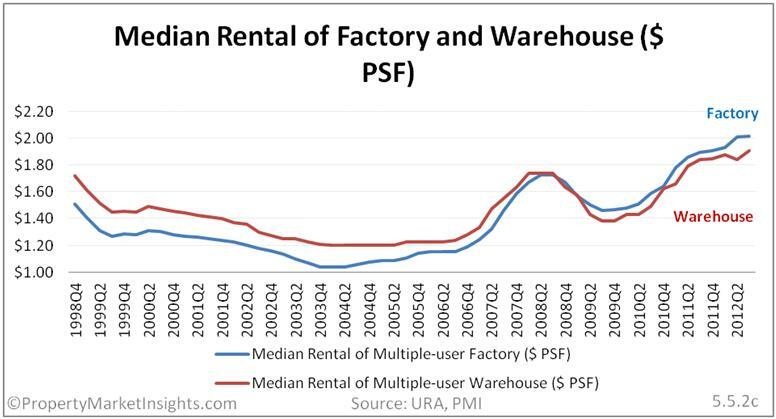 As of 2012Q3, the median rental of Factory and Warehouse space was fairly similar at $2.02 and $1.91 psf respectively (Figure 5.5.2c). Versus six years ago, this is an increase of around 60 percent. Has the profitability of our industrial companies and SMEs increased this much? More measures to control industrial property prices on the way? Given the relative stabilization of the residential property segment post six rounds of control measures since 2009, and the skyrocketing prices of industrial property, will this segment become the next target of government measures? We’ve previously written several articles about the industrial property market, including an explanation of the URA guidelines and a discussion on shoebox factories. Suffice to say that the continuing surge in industrial property prices has increased the policy risk for this sector. Measures to keep the minimum size of industrial units at 150 square meters and crackdowns on illegal usage of the space by non-industrial users could be just the beginning. Investors in shoebox industrial units will have to seriously ask themselves who the likely tenant for the property they have bought will be. Caveat emptor!